Not content to rest on the laurels of The Wizarding World of Harry Potter, Universal Orlando held a press conference this last week to unveil what they have planned for park guests for 2012. The January 25 conference included information on new attractions, upgrades to existing attractions and shows, and more that are coming to Universal Studios, Islands of Adventure and CityWalk. The popular Blue Man Group show will be debuting an entirely new show to audiences in February 2012. Their CityWalk theater is being revamped with cutting edge technology and the show will feature more interaction with the audience. New elements to the show include BMG interacting with enormous “GiPads” (not sure what exactly those are but it sounds fun). The finale will also feature new music. Hollywood Drive-In Golf is set to open in February, as well. Designed to resemble a classic drive-in theater, one side will be 18 holes of classic horror film themes and the other side will be 18 holes of sci-fi film themes. 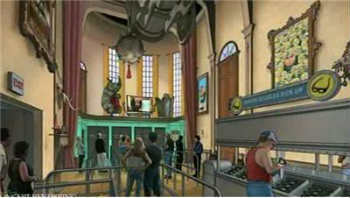 March 2012 brings an updated version of The Amazing Adventures of Spider-Man to Islands of Adventure. The film is being remade with 4K digital high-definition animation, which provides even more details to the effects and there will even be a cameo by legendary comic book icon and Spider-Man co-creator, Stan Lee. The ride will close on February 8 for the updates to be installed. New for Spring 2012 will be Universal’s Superstar Parade, a daily parade featuring characters like Spongebob Squarepants, the Despicable Me minions and more. The parade will take place at Universal Studios, with character meet & greets prior to the parade. 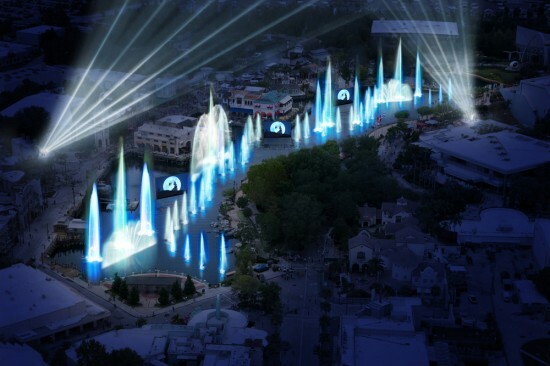 Also new for Spring 2012 will be Universal’s Cinematic Spectacular: 100 Years of Movie Memories. This ode to Universal Pictures and its legendary films will take place at the Universal Studios Lagoon and feature narration by award-winning actor Morgan Freeman. Images from the history of the studio’s film library will be shown on cutting-edge waterfall screens, with additional effects and pyro during this nighttime film that will show nightly all summer and then on select nights through the end of the year. 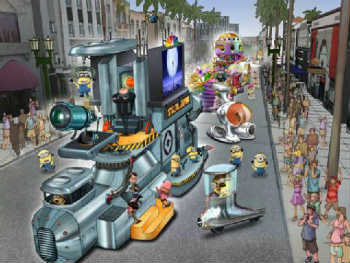 Based on the popular movie, Despicable Me Minion Mayhem is a new attraction that will open Summer 2012 where Jimmy Neutron used to be. It will take guests on a 3D adventure with Gru and his minion crew, as everyone is put through minion training. Steve Carell (Gru) and other actors from the film will reprise their character voices from the actual film. Still no word on what they plan to do with the area currently housing the now-closed Jaws and Amity Village attraction. There have been plenty of rumors, but nothing that we can confirm.